Below are all of the children that are currently enrolled at Heshima. 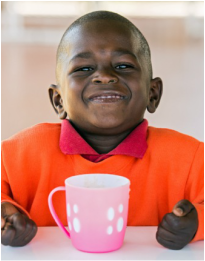 Our long-term goal is to serve 70+ children in the Nairobi, Kenya area. To see how you can help make this happen, click the 'Partner With Us' button below. Leon was at Heshima from 2008 until 2016, when he passed away from Cancer. He will be forever missed by all of us. His mom Rachel, continues to work at Dignity Designs as our head designer. Celestine is 14 years old and is cognitivly impaired. Malnutrition at a young age has led to delays in all areas of her life. 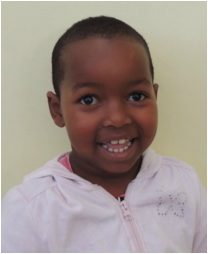 Heshima therapy has helped her improve her balance and speech. She has been at Heshima for nine years and has become a great teachers helper! Celestine's parents have both passed away and she is taken care of by her Aunt Janet. Her aunt works as our social worker at Heshima. .
Margret is 11 years old and has cerebral palsy. The cerebral palsy affects her legs and especially her feet. She has more difficulty controlling the left side of her body than her right side. When she came to us, she could not sit up. She is now sitting on her own and walking with the help of braces and a walker. She is very good at sign language and loves pretty shoes and dresses! Her mom Leah, is a jewelry designer at Dignity Designs. Princess is 6 years old and has cerebral palsy. Due to this, her muscles are underdeveloped and are being strengthened through physical therapy. She has recently learned how to hold her head up as well as sit. She loves music. Her mom Jane, is a teacher's at Heshima. Samuel is 10 years old. A few years ago, Heshima paid for his clubbed foot surgery. Since his surgery, he has received a lot of therapy and is now walking correctly. His mom Lucy, is a cleaner at Heshima. Dylan is 12 years old. He has two younger sisters and lives with his mother in the flats next to Heshima. He had a traumatic brain injury at age five because of abuse. This caused a brain bleed, which has left him paralyzed from the waist down. He also has minimal use of his hands and shoulders. 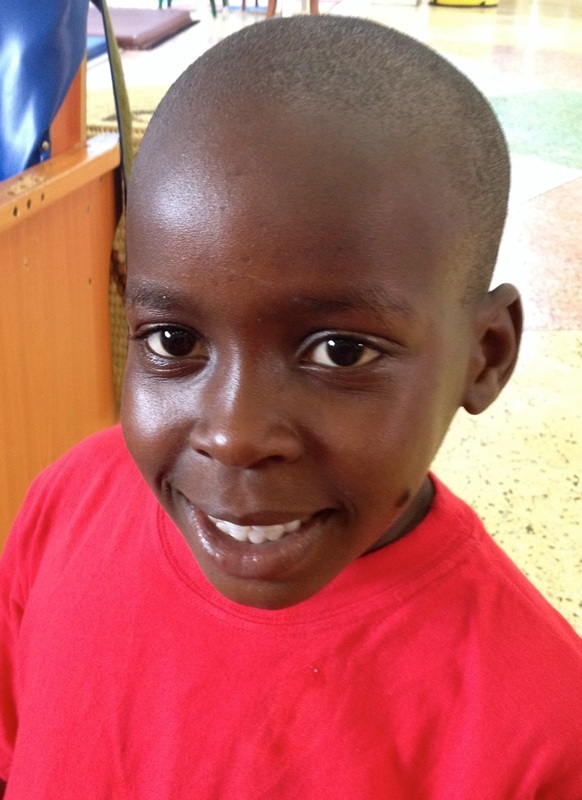 He is doing well in our Transition program at Heshima. He is enjoying art and music. His mom Caroline, is employed at Heshima as a teacher assistant. 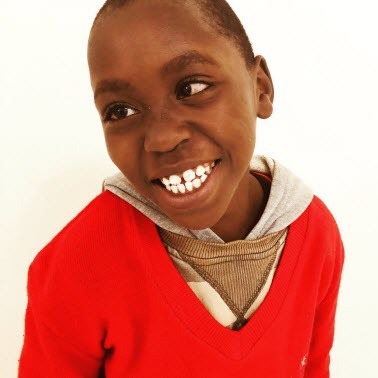 Bravin is 7 years old and has cerebral palsy. He has great language skills and can communicate his needs quite well. He is very much a "boy" and loves to tease the girls by taking their dolls away. 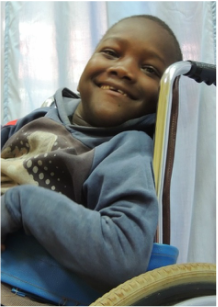 He is doing well in our Special Needs Program and is also receiving lots of physical therapy. His mom Irene, is a jewelry designer at Dignity Designs. Neville is 11 years old. He has learning difficulties due to a traumatic birth. He has potential to be the first soccer player that comes out of Heshima! He is doing well in our "top" class at Heshima. His mom Victoria, is a teacher assistant at Heshima. 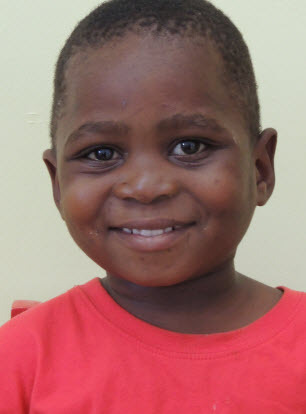 Bravin is 5 years old and has a global learning disability. He lives with his step mother and birth dad in the village close to Heshima. 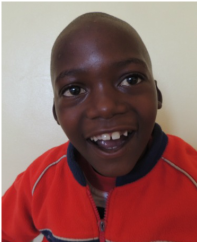 He is doing well in our Special Education Program and is receiving speech therapy for his langauge delays. His mom is a cleaner at Heshima. Naveri is 5 years old and has cerebral palsy. 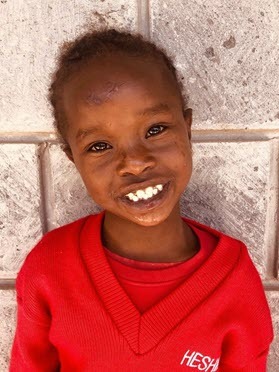 She does not walk but we are hoping through the physical therapy at Heshima, that one day we will see her walk. Her mom Gladys, stays at home. James is 5 years old and has Down Syndrome. 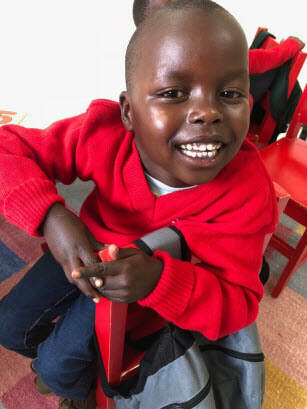 He adds life to our special education program and loves speech therapy. He has 4 siblings and his mom Damaris, works as a cook at Heshima. Alice is 7 years old and has Cerebral Palsy. She is very smart and has joyful spirit. Her mother Eunice works at Heshima as a cleaner. 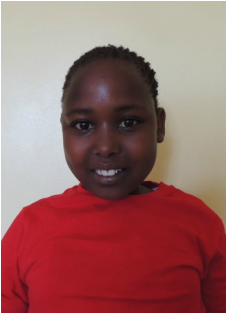 We hope to get surgery done to Alice in 2018 to correct her clubbed foot. Caroline is 7 years old and has Spina Bifida. She is very smart and enjoys pretending like she is the "teacher".Her mom Esther, is a teacher assistant at Heshima. Jayden is 5 years old and has Cerebral Palsy. He gets along well with the other children ad loves to dance. His mom is a teacher assistant at Heshima. since we introduced "Beauty Parlor Time" at Heshima. She loves to have her nails done as well as her makeup. We think she is going to be a fashion model one day! Nicholas is 5 years old. He has ADHD. His attention span is short but the teachers are working with him and progress is seen. Angel is 1 year old. She has delayed milestone. Currently, she is learning to crawl. We hope with time, she will learn to walk. Macharia is 12 years old. He is in our life sills program at Heshima. When he was two years old, he had a five hour seizure that caused brain damage. He has a learning and speech disability. He is very busy and is friends with all the kids at the center. 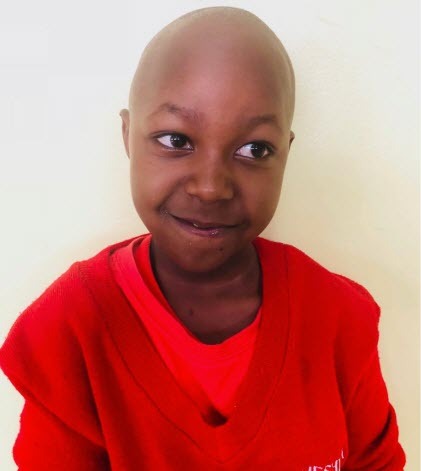 His mother, Josphine, is the manager at Dignity Designs and is thrilled by Macharia's progress. Agnetta is 11 years old and has cerebral palsy. 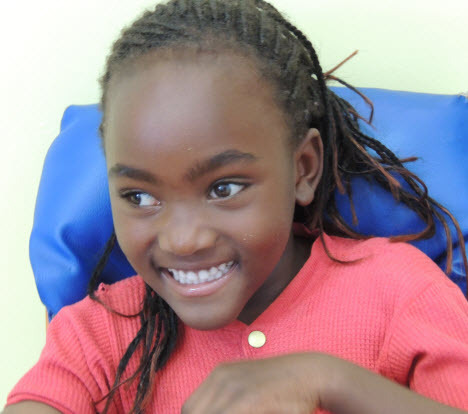 She is benefiting from Heshima therapy and has recently learned how to use a wheel chair. When she first came to us, she used to cry all the time but now, we cannot stop her from smiling. She is very smart and is great at sign language and doing puzzles. Her mom, Elizabeth, is the manager of our water company; "Water for Dignity." This is Kennedy who is 6 years old. 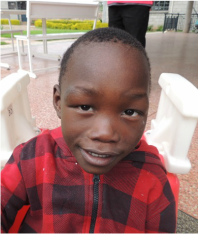 He has vision problems as well as physical and mental delays due to Microcephaly. His mom Jackie, works at Heshima as a teacher. She is so happy that she has a place for Kennedy and herself. Ruth is 12 years old. She has 10 siblings! She has ADHD and is developmentally delayed. We do not know much about her past but we can assume she has suffered from malnutrition which in turn, effects her brain development She is doing well in our Life Skills program at Heshima. She receives speech and occupational therapy, both are helping her progress. He mom Damaris, is our cleaning manager at Heshima. Sharleen is 3 years old and has cerebral palsy and epilepsy. She sleeps a lot because of the medication she takes for her epilepsy. 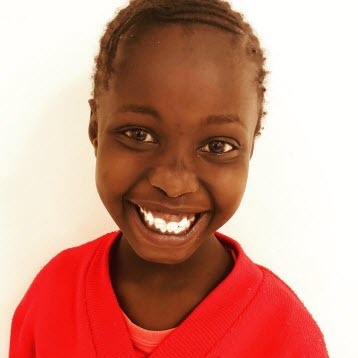 She is doing well in our Early Childhood Intervention program where she receives physical and occupational therapy as well as proper nutrition and lots of play time. Her mom Florence, is working as a cook at Heshima and is doing a great job! Rachel is 10 years old and has a global learning disability. She is now learning to read and do math and is in our "top" class.Her mom Nancy, is working as a teacher assistant. Tracy is 14 years old. She has been at Heshima since January 2016. She is doing well in our Life Skills program. Her mom Sarah, is learning disabled and has 3 other children. She is a cleaner at Heshima. ​Elvis is 8 years old. He smiles all the time and is such a joy for us to have at Heshima. He joined us in January of 2016. He has a learning disability that kept him behind in his former school. His mom Damaris, is a gardener at Heshima. Ann is 12 years old and has cerebral palsy. She spent many years in a a school that was not helping her and we are glad that she finally found Heshima. She is now reading and writing and her mom Wairimu, works as a cook at Heshima. 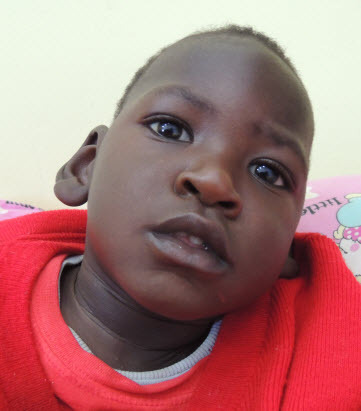 Weldon is 2 years old and has Microcephaly. He is the Heshima "baby" and we love to carry him around campus. His mother Deborah, is a teacher at Heshima. 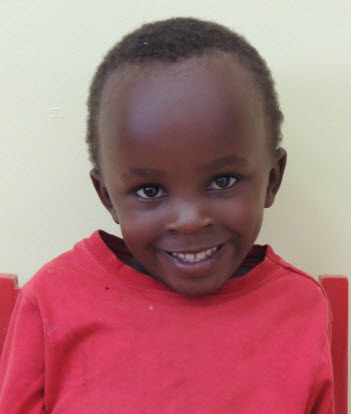 Leon is 5 years old and has hydrocephalus. He is easily distracted and needs a lot of one on one time. He likes to jump on the trampoline at Heshima. His mom Lydia, works at Heshima as an office assistant. Jimmy is 5 years old. He has Cerebral Palsy. He likes to wrestle with the other boys and doesn't sit still for a very long. He brings a lot of energy to Heshima. His mom is a teacher assistant at Heshima. 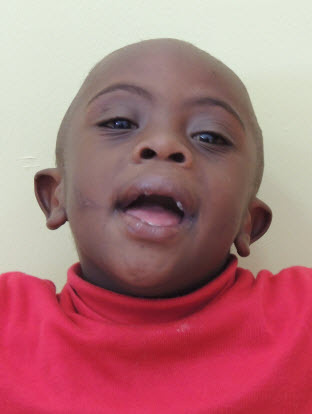 Blessing is 3 years old and microcephaly. She has trouble eating and swallowing but our speech therapist is working with her closely. We are hoping she will gain some weight. Susan is 7 years old. You would never know that she struggles each day to breath because she is always smiling. Due to her disability, her airway becomes obstructed easily and she often needs nebulizer treatments. We are not sure if this problem is long term for her but we hope these treatments will help. Lawrence is 7 years old. He was abandoned by his mother at a young age because of his disability. His loving grandmother took him in and has since brought him to Heshima. He has lots of potential and is always smiling. He is learning to read and write and enjoys music time. Richmond is 5 years old. He is very active and loves to play with the other kids at Heshima. His mom Faith, is employed as a teacher assistant and she is a hard worker.